Synthetic Based Drilling Fluids for Flat Rheologies & Low-ECD | Newpark Resources Inc. Between the temperature differential from the deepwater seafloor to the bit and the narrow fracture gradient window caused by reduced overburden or depleted reservoirs, designing a deepwater drilling fluid with optimized rheological properties can be the answer to this challenge. The temperature at the seafloor can be as cold as 32 to 40°F (0 to 4°C), while bottom-hole temperatures in deepwater environments average about 250°F-300 °F (120°C to 150°C). 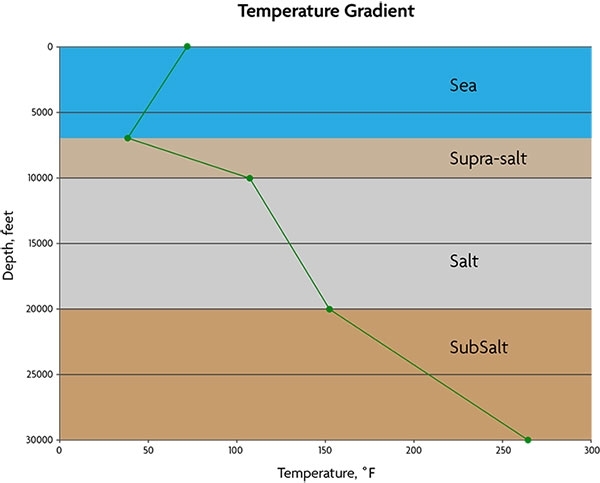 A deepwater drilling fluid must have sufficient low-end rheologies (6 & 3 rpm dial readings) to provide hole cleaning and barite (weight material) suspension at high bottom-hole temperatures near the bit, but must have a sufficiently low gel strength to break to resume circulation in the cold-temperature environment of the riser near the seafloor. Additionally, a thinner fluid reduces pressure losses and optimizes flow rates allowing for increased rates of penetration, faster tripping, and reduced spike in equivalent circulating density (ECD). Newpark’s Kronos™ synthetic-based drilling fluid system builds on decades of experience with the CyberDrill fluid system. It is a versatile deepwater drilling fluid designed using a unique set of products for deep water’s challenging environments including flat rheologies and low-ECD. The Kronos Flat Rheology formulation provides a consistent rheological profile over a wide range of temperatures and pressures. Its low temperature gel structures reduce pressure spikes thereby stabilizing ECD and reducing losses due to induced fracturing. Its low-end rheologies provide efficient hole cleaning and barite suspension. The Kronos low-ECD formulation was designed specifically to reduce ECD spikes magnitude through minimization of pressure losses and optimization of flow rates. These characteristics are achieved at any given fluid density by lowering the overall rheological characteristics of the fluid while minimizing sag potential. The Kronos Low-ECD system is appropriate for deeper well sections with narrow wellbore diameters. Kronos systems are stable over a wide range of temperature and pressure.